FRONT & CENTRE: The pantomime's newcomers are a diverse bunch passionate about the stage. 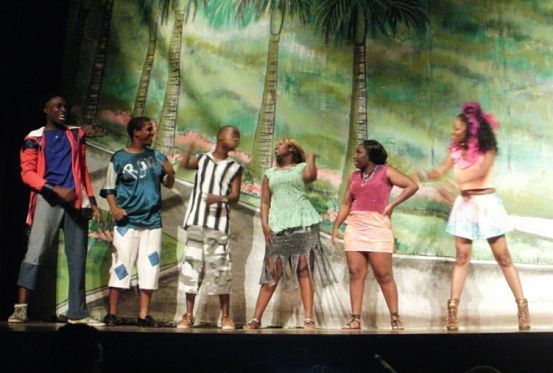 Smart and savvy young Jamaican actors who take the craft seriously are always on the lookout for opportunities in the performing arts to hone their talents and upgrade their skills. In the local arts community, the LTM Pantomime Company offers the ideal launching-pad for these up-and-comers, as they get to sing, dance and act and learn the ropes of the industry, while following in the footsteps of such distinguished pantomime alums as Miss Lou and Mass Ran, Michael ‘Stringbean’ Nicholson, Nadean Rawlins and Oliver Samuels. This season, six fresh faces make their debut in the national pantomime, bringing boundless energy and laudable commitment to their small roles in the Robert Clarke-directed musical comedy The Upses & De Downzies Dem. It’s a diverse bunch of youngsters who are passionate about the stage and seem intent on making the most of the chance they’ve been given. “It’s been a great experience. I never thought I would get the opportunity to perform in a production like the pantomime, so it’s a dream come true,” says Janelle Wilson, a 20-year-old student, who is currently reading for a degree in Business Administration at UTech, where she also studied drama as an elective.